Residents living near the Buncefield oil depot blaze have been returning home after crews said fires in all the tanks had been extinguished. On Tuesday evening fire broke out again after petrol vapour ignited from a previously undamaged tank at the site in Hemel Hempstead, Hertfordshire. The fire brigade said the flames were safely contained and would be allowed to burn out. Most of the schools closed in the wake of the blaze will reopen on Wednesday. 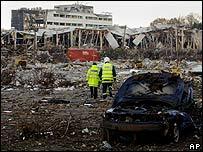 The only exceptions would be the few very close to the depot which were left structurally damaged by the series of explosions on Sunday, said Hertfordshire County Council. Fire crews would remain at the scene over the next few days cooling the area to ensure fires did not break out again, Hertfordshire Fire Service chief Roy Wilsher said. Meanwhile, the Fire Brigades Union (FBU) has accused Hertfordshire Fire Authority of being "woefully prepared" to deal with the blaze. 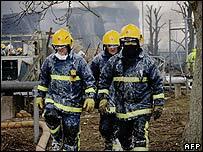 "It's quite amazing, really, that Hertfordshire Fire Brigade have got a major oil refinery in their own ground and the chief fire officer this morning admitted himself that they have no officers trained to deal with such an incident," national officer Geoff Ellis told BBC News. But Mr Wilsher said he was "stunned by the inaccuracy and venom" of the FBU's criticisms. "Their claims are utter nonsense and this is pure opportunism of the worst possible kind," he added. The minister responsible for the fire service, Jim Fitzpatrick, told BBC Radio Five Live he was satisfied that the arrangements in place had worked exceptionally well. "What we should be doing is congratulating the performance, the professionalism and the bravery of the emergency services, fire police ambulance as well the local authorities and everyone else who contributed to try and deal with a very, very difficult situation," he said. Deputy Prime Minister John Prescott has been holding a meeting of the Cobra civil contingencies committee to discuss the events at Buncefield. Some residents are being allowed to return to their homes within an exclusion zone set up around the site. Their buildings will be checked to make sure it is safe for them to remain. Those unable to return should continue to stay with friends or relatives or at a reception centre at Hemel Hempstead Sports Centre, Dacorum Borough Council said. Dr Jane Halpin from the local health authority said air quality tests had shown a "reassuring" lack of toxic chemicals around the depot. People living near the Hemel Hempstead site, however, are still being urged to stay inside with their doors and windows closed, to minimise any chances of suffering ill effects from the huge plume of smoke billowing from the site. A Met Office spokesman said the wind had switched from south-westerly to northerly on Tuesday, pushing the smoke from the fire towards the south. There are fears soot could cause problems at ground level as the plume falls to earth once the blaze has been put out. The blaze began just after 0600 GMT on Sunday, when the first of a series of explosions hit the site. Forty-three people have been injured. One person admitted to Watford General Hospital intensive care unit with respiratory problems remains in a stable condition. A police advice line for affected residents and businesses has been set up on 0800 0960095. Police say there is "nothing to suggest" the fire was anything other than an accident. 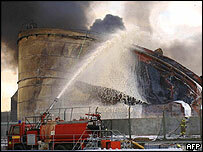 And a spokesman for Total denied there had been leaks in the run-up to the explosions. Hertfordshire Police are investigating claims that a tanker driver thinks he may have triggered the blast by flicking the engine cut-out switch on his vehicle while there was a vapour leak from the plant. Wednesday's Sun newspaper carries claims from a colleague of the driver - who escaped with a few bruises and a burst eardrum - that "he is so traumatised he has severe flashbacks and can't switch on a light in his lounge". The police said it was still too early to say what caused the fire. The Buncefield depot is a major distribution terminal operated by Total and part-owned by Texaco, storing oil and petrol as well as kerosene which supplies airports across the region, including Heathrow and Luton.